For some, winter tends to dampen spirits. The bitter cold and grey skies deter them from getting dolled up and heading out for a night on the town. They’d rather rent a movie on Netflix (because who can even be bothered to drive to Blockbuster), settle down with an extra large mug of hot chocolate, and plant themselves on the sofa for the night. The chilly air has exactly the opposite effect on me. It invigorates me. It refreshes me. It excites me. I am ready to roll in the winter time. If you plopped me down in the sticky heat of the summer, I’d have an activity level to rival a three-toed sloth, but give me a chilly December evening and I will be thrilled. One of the best things about the icy months is the shift toward comfort foods. Macaroni and cheese and warming stews abound, but people tend to forget about the wonders of seasonal drinks. Nothing beats that frozen feeling like a toasty hot toddy, and eggnog is a deliciously rich accompaniment to a mid-winter meal. They don’t call it an alcohol blanket for nothing. So, in honor of the frosty season, my flatmates and I threw a Siberian party, complete with girls draped in fur, bottles and bottles of vodka, and a nice, big bowl of Blind Russian. 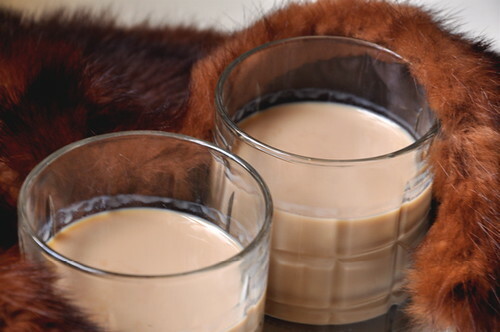 A Blind Russian is different from a White Russian in that it contains Baileys in place of the heavy cream. Be careful, as these are quite strong, and one too many might make the name too applicable for comfort. Pour vodka and Kahlúa into a small glass. Fill the rest of the glass with Baileys. Stir to combine. I don't normally mix up alcoholic beverages at home but I am thinking this an absolute must. Thanks for looking out for us all.